This book is about a little known historical epoch in China's history. The book starts with the story of Sun Yat-Sen. He is the person most responsible for the fall of the Chinese Empire. Now, Empire would be a strange word for the disjointed country that China was at the time. The Western Powers had used a fillet knife on China during the last 100 years. The road toward China being a puzzle missing many pieces had started in the early 19th century. Shortly after that China was torn apart for two decades by the Taiping Rebellion. This killed tens of millions of Chinese. At the start of the twentieth century, China was further embarrassed by the results of the Boxer Rebellion. The Boxer Rebellion had unified a lot of Chinese for the express cause of ridding the country of foreigners and their influence. Unfortunately, its collapse and the warfare involved brought only more concessions to the west. The book continues with the history of Puyi, the last emperor of China. He was forced to abdicate as a child, but was brought back as a puppet emperor by the Japanese for Manchukuo (this was the Chinese area of Manchuria with some surrounding areas). The Japanese aggression in the 1930s and 1940s is also delved into. The Communists were originally a part of the 'United Front' with the Kuomintang. The National Revolutionary Army put Chiang Kai-shek into power in 1925. He was now the leader of the Kuomintang. This was supposed to be the government of China, but instead only held sway over the Southeastern part of China. The rest was ruled by warlords who ran the other parts of China as their personal domains. Chiang Kai-shek did his best to wrest some of the country back from the warlords in the next few years. Chiang also purged the Kuomintang of all Communists and after some tense fighting the Communists were almost completely wiped out. This led to the 'Long March', where the Communists tried to put as much territory between themselves and the Kuomintang. Soon after the Japanese put pretenses aside, and their predations on China became an actual war. The Communists and the Kuomintang entered into somewhat of a truce until the invading Japanese were defeated. The main part of the book starts right after the Japanese defeat in 1945. The Communists and Kuomintang were poised for their final battle over the control of China. The book itself is a small one at 127 pages. It does however pack a large punch into a small frame. The history of the war between the two from 1945 to 1949 is gone through. The book also goes into the reluctance of the United States to back Chiang and the Kuomintang. This is somewhat surprising given the United States policy in Asia after this (The Korean and Vietnam Wars to stop the spread of Communism). 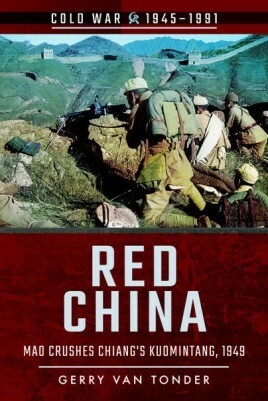 For a short book it also goes through the Soviet Union's involvement with both the Kuomintang and Communists, along with other not well known history. For anyone who is looking to know the broad sweep of this moment in history, or is looking to start delving deeper into it, this book is a must. It is the perfect jumping off place for more reading.